Water on the ground surface moves downhill, creating small channels or rills that, over time, become persistent channels. The channels join others, forming a treelike network of increasing drainage area. In reality, each additional tributary causes drainage area to increase in steps, rather than smoothly, but as an approximation, channel length increases as the 0.6 power of drainage area1 increases. Stream networks generally increase in length more than width, and develop particular shapes depending on topography and the erodibility of the land surface. A stream draining a narrow valley often results in a central channel with numerous, short tributaries entering almost at right angles, whereas more gentle terrain can lead to a rounder drainage basin. Various descriptive terms (dendritic, radial, rectangular, trellis) are used to describe these patterns. Drainage density (the sum of channel length divided by drainage area, in km/km2) is a measure of how finely dissected the network is, and tends to be lower in more xeric (drier) locations. Relief ratio is the elevation difference divided by river length along the main axis, and thus is related to gradient and the pathway that the river takes. 1 Drainage area is the term commonly used when discussing the river network, and refers to the total area drained by the multitude of tributaries that feed the main channel or set of channels. It is interchangeable with catchment and (in American usage) watershed area. River basin can also be substituted, although the convention is to restrict its use to very large rivers. maps). The exact transition between an ephemeral and first-order perennial channel is indistinct, and migrates up- and downslope depending on precipitation. Stream order is a useful measure because it describes the position of a stream in the hierarchy of tributaries (Table 1.1). The union of two first-order streams forms a second-order stream, defined as having only first-order channels as tributaries. A third-order stream is formed by the coalescence of two second-order streams, and so on (Figure 1.2). This system, originated by Horton (1945) and later refined by Strahler (1952), is perhaps the most widely used classification system for streams and rivers, but it has limitations (Hughes and Omernik 1983, Richards 1982). The identification of first-order streams is challenging, and if done using maps, will vary with map scale (1:24,000 or 1:25,000 is recommended), thereby affecting all higher-order designations. Because of differences in drainage density across regions, stream size and stream order may not correlate well. In addition, this approach ignores the entry of streams of order n into order n + 1. Link classification incorporates the addition of first-order streams into higherorder branches of a drainage network, but shares the other failings. Nonetheless, stream order has been a durable concept because of its simplicity and its usefulness. In addition, stream order classification is useful as a correlate of other catchment variables. Mean length, total number, and to a lesser degree mean slope all form straight lines when their logarithmic values are plotted against stream order. There are usually some three to four times as many streams of order n — 1 as of order n (the bifurcation ratio), each of which is roughly less than half as long as the stream of next higher order, and drains somewhat more than one fifth of the area. These ratios can be verified by inspection of Table 1.1, which summarizes the number, lengths, and drainage areas of US streams of order 1-10. This table shows convincingly that the vast majority of streams are of low order. Typically, first- to third-order streams comprise 70-80% of the total length of perennial channels in a catchment, emphasizing how land-water connections are tightly coupled in headwaters. 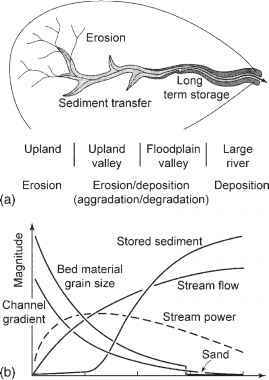 The river continuum concept (Figure 1.7) uses stream order as its physical template, and many stream ecologists find stream order to be a convenient indicator of size and longitudinal position.